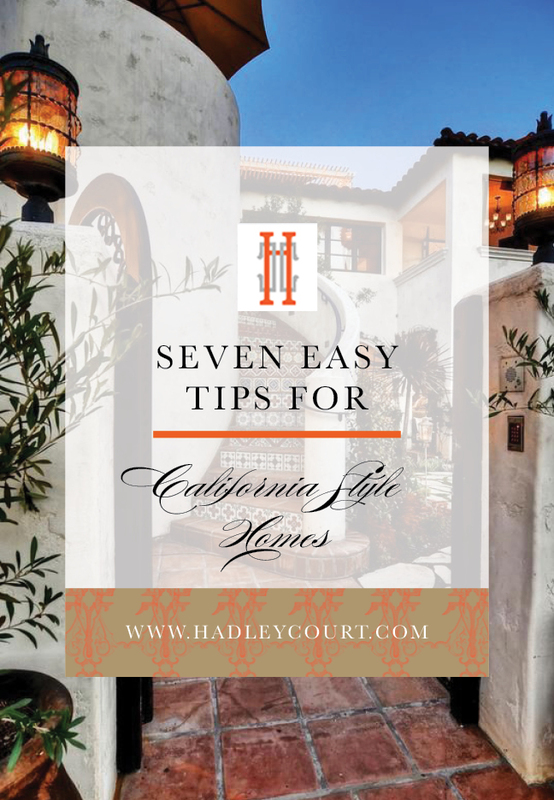 California Style Homes – 7 Easy Tips! Isn’t California lovely? Every time I visit, I dream about living there. The weather is almost perfect year round. Northern California is breathtaking. My family loves skiing in Tahoe. I’m not a skier, but I enjoy spending time in the mountains. In California, you’ll find many styles of homes that are unique to the state. There is the California signature style Spanish colonial home, art deco in Silicon Valley, & the Victorian homes in San Francisco. 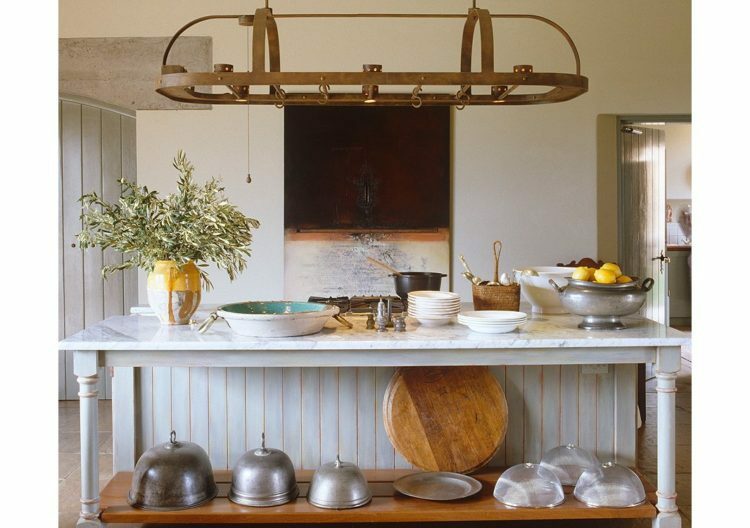 The key to California style homes is simple: light…in all its variations. I can’t help but look to my west coast neighbors for a little design inspiration. 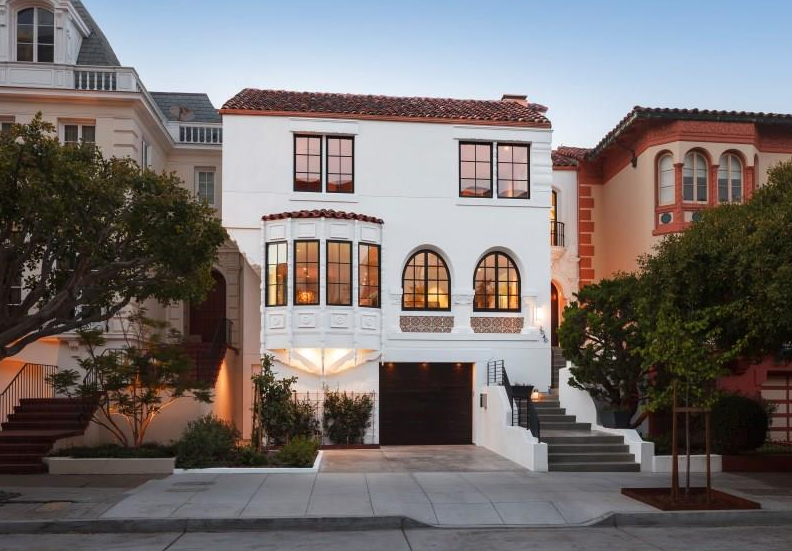 The outdoor is extended through the use of courtyards or verandas in this Mediterranean style house brought to California from France, Italy & Spain. 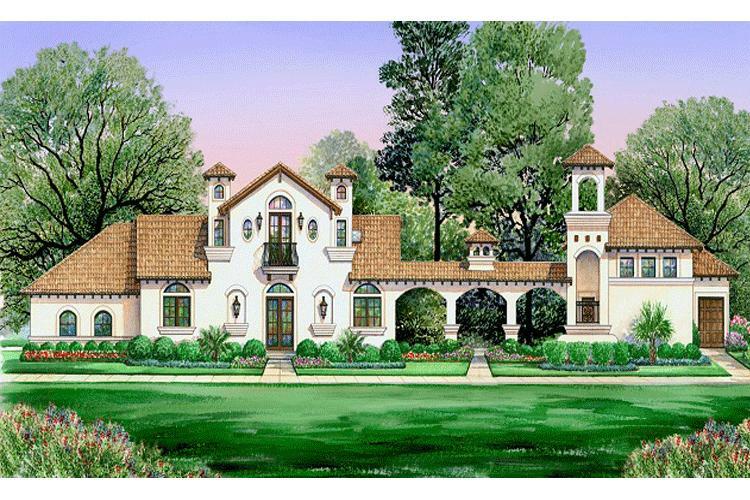 The contrast between the light stucco & the dark roof is what gives these homes their stunning curb appeal. 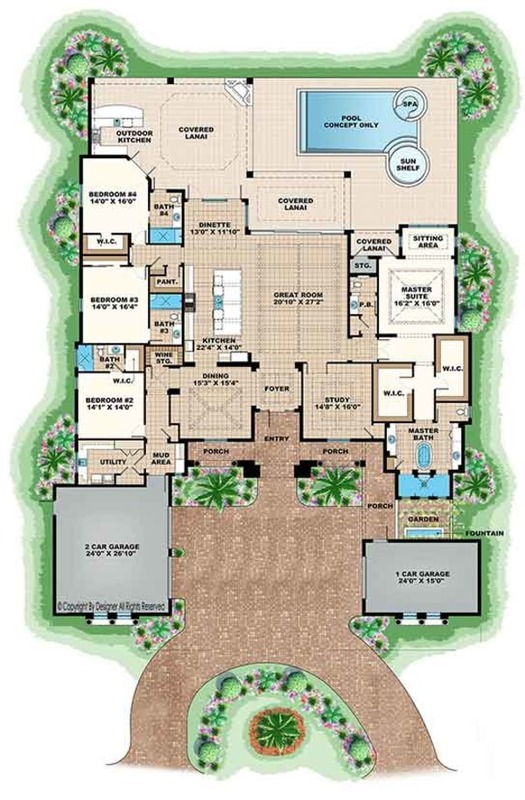 Californian homes are often characterised by Mediterranean floor plans. This Mediterranean floor plan has an open floor plan which allows for easy flow between the dining, kitchen & living room. The indoor/outdoor design is perfect for entertaining. Modern style homes are also very popular in California. Their bold designs in glass, chrome & steel make them chic & stylish. 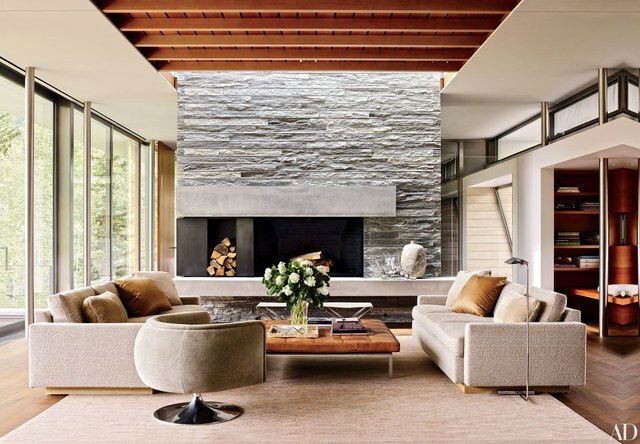 The symmetry in this modern living room is accented by the hardwood which adds a natural touch to the glass & chrome. The niche allows for decorative display without taking up space. All the glass gives the interior a bright & breezy feeling. 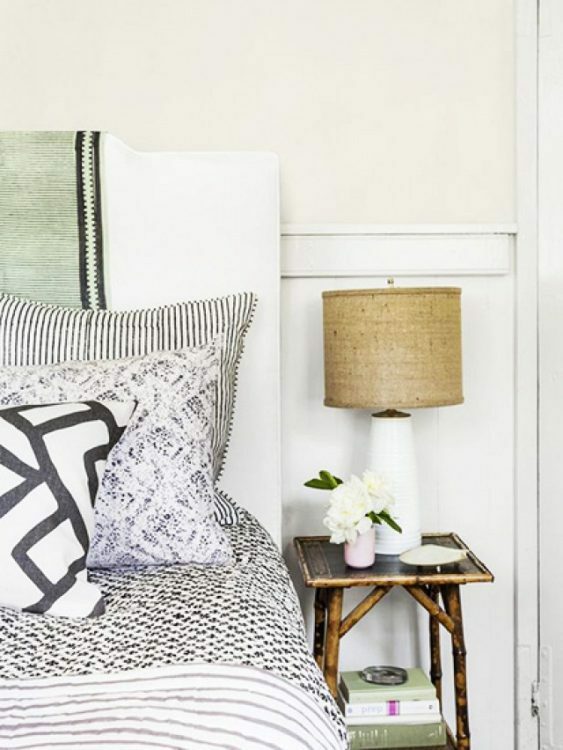 Here are 7 ways to re-create that easy, breezy, beautiful Californian feeling in your home! 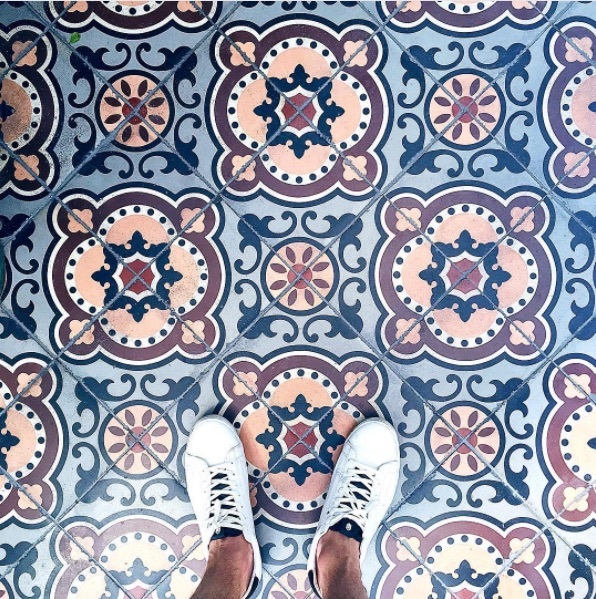 Terrazo tile is two things: fun, and the summer’s best-kept design secret. The concrete base with a marble finish keeps the floors cool even in scorching, hot weathers. Like playing a game of Tetris, the possibilities are endless with these little pieces of floor magic! 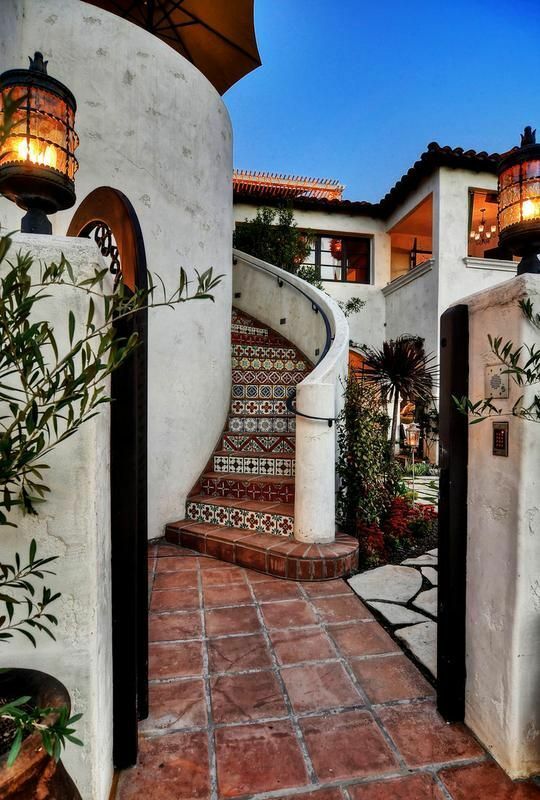 The curved staircase in this courtyard entry gives visitors an element of surprise. And the mosaic tile accent adds more interest. Get your books out, this study is anything but serious. Channel that soft, easy-going energy (Pacific Standard Time) by creating a small nook where you can simmer down on those hectic days. You can opt for buying a comfortable daybed or improvise by creating one by adding a soft cushion to a bench. When you are creating your Nook size does matter. Nooks are small places but they do need to be practical. If the Nook is going to be for you it’s important to plan that you can get in and out easily and that you can stretch your legs inside. Placing the nook or padded bench under the window will create the quintessential reading nook. Your contractor can even build storage into this padded bench. Finally don’t forget lighting. You could use overhead, wall or floor lamps to make your Nook attractive to use no matter what time of the day it is. 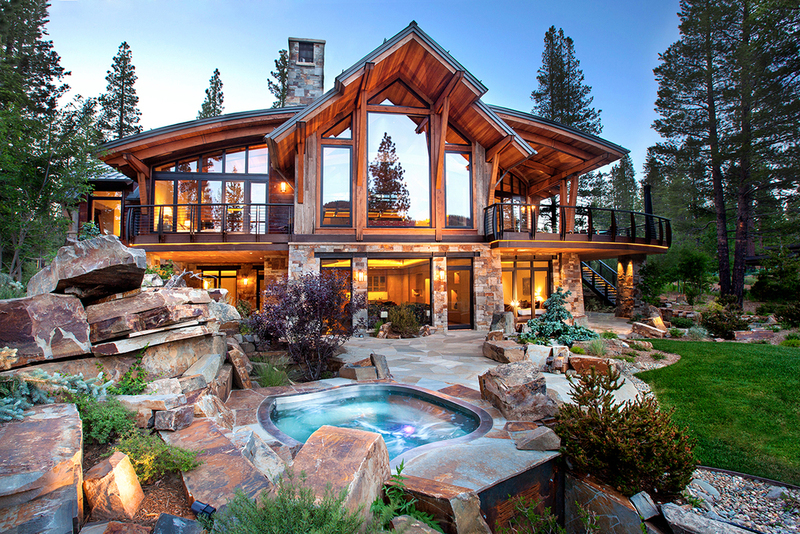 Imagine yourself relaxing in your nook in this Tahoe Mountain home! 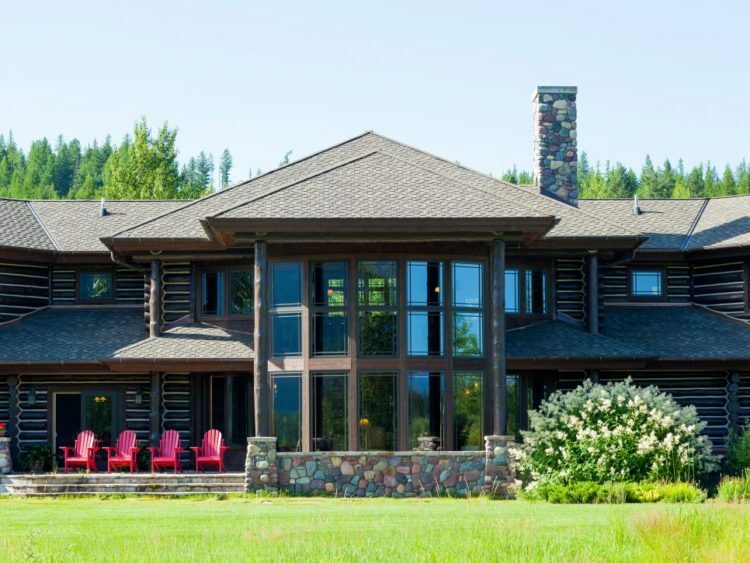 The stone & wood make this home look like its part of nature. I know what you’re thinking… “a pile of logs, really?” When your entire home isn’t ready for a wooden make-over there’s a little trick to bring that California cabin without cutting down too many trees. 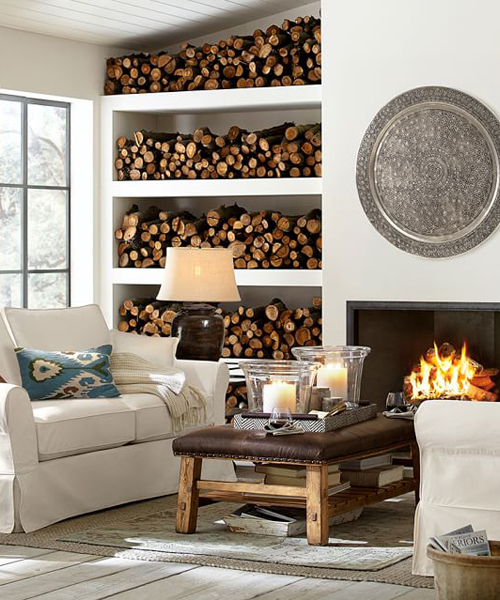 Add some decorative logs to your home for the rustic California cabin look. b) softens the room and adds a unique twist to a timeless material. After all, California is home to the world’s largest beauties in the world, the giant sequoia! 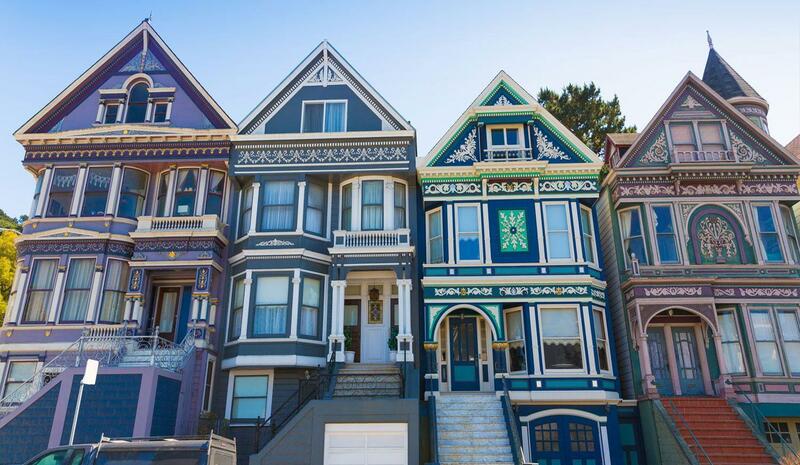 San Francisco is known for its variety of homes, most notably for Victorians. The decorative facades resemble doll houses and have a combination of texture & variation by the use of turrets, gables & paint color. These homes are narrow & tall, many levels with multiple staircases – no need to go to the gym when living in a Victorian! Rather than recreating the rainbow, play with textures as an option. Tweeds, woods, kilim, cork, brick, wool — when it comes to touch, these elements are an eye candy and then some. 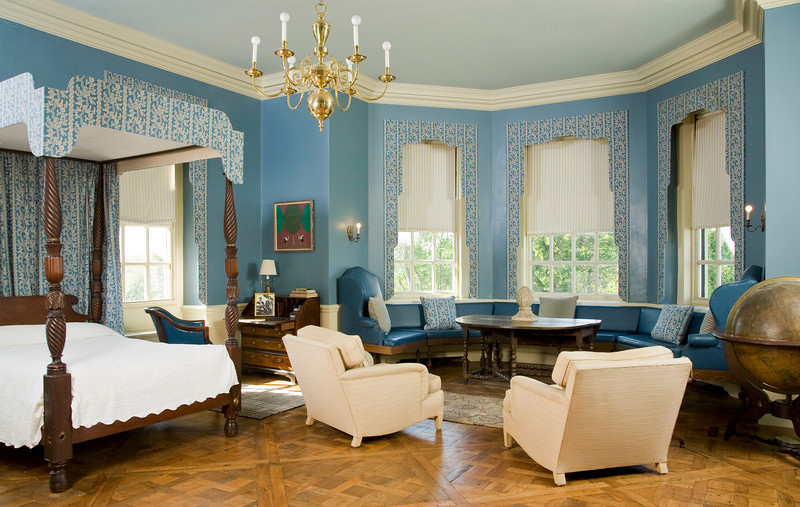 Settle into this Victorian bedroom. It has a warm, rich feeling created from the blue paint & dark wood. Look at all the textures used in here! They’ve created a very stylish room. California’s location lends itself not only to the sunniest of days but also a vast amount of Spanish influence. Spanish revival is a common style for many of the golden staters. Arched doorways adhere to this type of design and are a great way to create an easy, elegant and stylish transition between rooms. There’s an ‘AHA’ moment waiting to happen in your dining room, give your visitors a teaser with this entryway. Skylights are quite the fanciful asset to any home. Having one is a delight of its own. 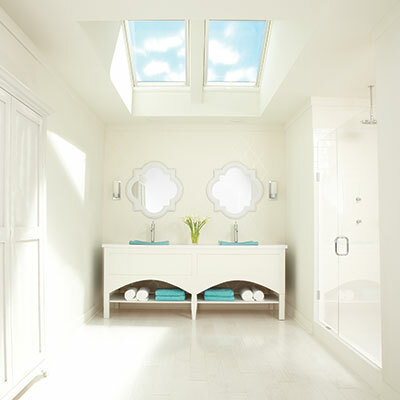 Installing a skylight in the bathroom is dreamy! For those that don’t have the architectural luxury, you can still simulate one as if you did. White tiles add depth to the room and lighten things up, recreating sunlight without the sun! Remember the bigger the size of the tiles the larger the space looks and the less grout to clean. We call that a win-win! For the classicists out there, minimal or modern are two words foreign to their design vocabulary. Contrary to their disposition, here’s a way to appease the old world with today’s rhetoric: marble. Marble is one (if not THE) most versatile element out there. It isn’t just for flooring. Marble can serve as the backdrop or as a complementary surface area wherever it’s located. When juxtaposed against classic materials such as oak (seen above) the marble brings out a rustic feeling, sure to satisfy any aesthete’s design palate. Rain or shine, gather all the best the golden state has to offer! Want to know more? Take a look at our previous post The Elements of California Design. What do you think? 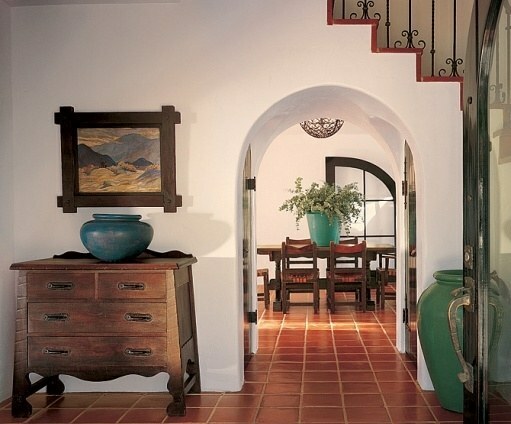 Have you tried to replicate Californian Style Elements in your home? Leslie Hendrix Wood is the founding editor of the luxury lifestyle and design blog, Hadley Court and an has her own interior design firm, Leslie Hendrix Wood Interiors in Midland, Texas. Leslie received her undergraduate degree in business. She worked briefly in banking and returned to school to earn her MBA. Upon graduation, she moved to Washington D.C. to work on a Presidential campaign and received a Presidential appointment to a position in International Trade. At the end of the administration, Leslie returned to her hometown and joined the family oil and gas business, although her first passion has always been, after raising her children with her husband, business and interior design. When she saw her children were closer to leaving home, she decided to start the blog, Hadley Court. in 2012, which won the Design Bloggers Conference Hall of Fame award for Best New Design Blog in 2013 - a prestigious honor granted by her peers. In 2014, she is, in addition to blogging, beginning to build the family friendly luxury lifestyle brand: HADLEY COURT, based on her values of Gracious Living, Timeless Design and Family Traditions.